Guten Tag! I’m bringing you this post today in light of a special day tomorrow, October 6th 2016. Tomorrow is German-American Day in the USA! This is a day to celebrate the German heritage in America. Specifically, it commemorates the date in 1683 when 13 German families settled in Philadelphia and subsequently founded Germantown, Pennsylvania. German-American Day is now a yearly celebration of the German heritage in America. It was originally celebrated in the 19th century, died out for a while during World War I (unsurprisingly due to the anti-German attitude of the time), and then was revived in 1983 to mark the 300th anniversary of German immigration to the USA. German-American Day is now a public holiday in the USA. Various celebrations for it are organised by the German-American Heritage Foundation of the USA. In German, it is called Deutsch-Amerikanischer Tag. You might be surprised to hear it, but there is a rich German heritage in both north and south America. In fact, there are approx. 50 million German Americans in the United States alone. Von Steuben Day is a celebration for German immigrant Baron Friedrich von Steuben, who came to the USA in the 18th century to offer his services to George Washington. 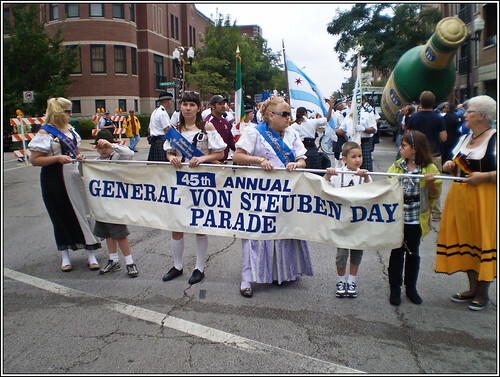 Von Steuben Day is traditionally celebrated in September in various cities across the USA, the biggest one being the German-American Steuben Parade, held in New York City. Amongst other things, it features marching bands playing traditional German music. Pennsylvania German is a German dialect spoken in parts of the USA by people with German roots. American English has had a huge influence on it, resulting in a fascinating mix of German and English. I covered Pennsylvania German (also called Pennsylvania Dutch) on the blog here and here. Oktoberfest, the famous Bavarian beer festival held annually in Munich, is also celebrated in several American towns with German heritage, including Fredericksburg in Texas and Frankenmuth in Michigan – a town often nicknamed ‘Little Bavaria’. But for now, wherever you are, enjoy Deutsch-Amerikanischer Tag! Servus! I'm Constanze and I live in the UK. I'm half English and half German, and love writing about German language and culture. I also work as a group fitness instructor. Why yes the topic is quite interesting. On a smaller scale Octoberfest is also celebrated in Malta. A Bavarian band comes over to aid to the merriment and help the beer go down in good spirit. Please stop with the Dutch. We are not Dutch and do not speak Dutch. We speak Deutsch. May be we butcher up the language but we are not Dutch. @Barry Hummel Barry, work on your reading comprehension. She did not say they were Dutch. She said it’s a German dialect spoken by people with German roots. And whether you like it or not, it is called Pennsylvania Dutch, because in the 17th & 18th century the English didn’t care about saying Deutsch properly, they said Dutch, and it stuck. You wrote that German-American Day ” commemorates the date in 1963 when 13 German families settled in Philadelphia and subsequently founded Germantown, Pennsylvania.” Are you sure it’s 19…63? I believe you meant 1693, not 1963.